“Tampa” redirects here. For other uses, see Tampa (disambiguation). Tampa /ˈtæmpə/ is a city in the U.S. state of Florida. 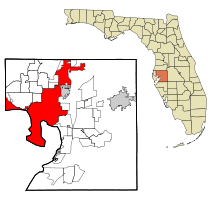 It serves as the county seat for Hillsborough County and is located on the west coast of Florida, on Tampa Bay near the Gulf of Mexico. The population of Tampa in 2011 was 346,037. 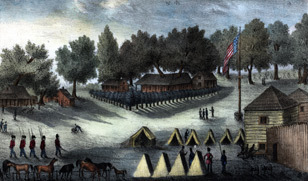 In 1824, the United States Army established a frontier outpost called Fort Brooke at the mouth of the Hillsborough River, near the site of today's Tampa Convention Center. The first civilian residents were pioneers who settled near the fort for protection from the nearby Seminole population. The town grew slowly until the 1880s, when railroad links, the discovery of phosphate, and the arrival of the cigar industry jump-started its development and helped it to grow into an important city by the early 1900s. Today, Tampa is a part of the metropolitan area most commonly referred to as the Tampa Bay Area. For U.S. Census purposes, Tampa is part of the Tampa-St. Petersburg-Clearwater, Florida Metropolitan Statistical Area. The four-county area is composed of roughly 2.9 million residents, making it the second largest metropolitan statistical area (MSA) in the state, and the fourth largest in the Southeastern United States, behind Miami, Washington, D.C. and Atlanta. The Greater Tampa Bay area has over 4 million residents and generally includes the Tampa and Sarasota metro areas. The Tampa Bay Partnership and U.S. Census data showed an average annual growth of 2.47 percent, or a gain of approximately 97,000 residents per year. Between 2000 and 2006, the Greater Tampa Bay Market experienced a combined growth rate of 14.8 percent, growing from 3.4 million to 3.9 million and hitting the 4 million people mark on April 1, 2007. A 2012 estimate shows the Tampa Bay area population to have 4,310,524 people and a 2017 projection of 4,536,854 people. In 2008, Tampa was ranked as the 5th best outdoor city by Forbes. A 2004 survey by the NYU newspaper Washington Square News ranked Tampa as a top city for "twenty-somethings." Tampa also ranks as the fifth most popular American city, based on where people want to live, according to a 2009 Pew Research Center study. Tampa is now ranked as a "Gamma+" world city by Loughborough University. According to Loughborough, Tampa ranks alongside other world cities such as Phoenix, Indianapolis, Rotterdam, and Santo Domingo. In recent years Tampa has seen a notable upsurge in high-market demand from consumers, signaling more wealth concentrated in the area. Tampa hosted the 2012 Republican National Convention. The war ended in April 1865 with a Confederate defeat. In May 1865, federal troops of the 2nd U.S. Colored Infantry Regiment arrived in Tampa to occupy the fort and the town as part of Reconstruction. They remained until August 1869. 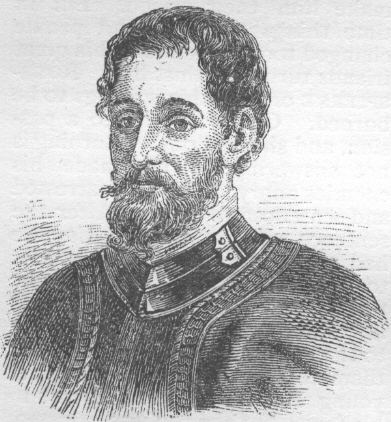 Henry B. Plant's narrow-gauge South Florida Railroad reached Tampa and its port in late 1883, finally connecting the small town to the nation's railroad system after years of efforts by local leaders. Previously, Tampa's overland transportation links had consisted of sandy roads stretching across the Florida countryside. Plant's railroad made it much easier to get goods in and out of the Tampa Bay area. 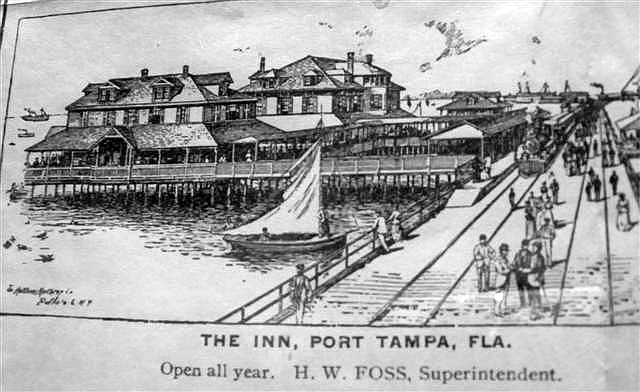 Phosphate and commercial fishing exports could be sent north by rail and many new products were brought into the Tampa market, along with the first tourists. The era of rampant and open corruption ended in the 1950s, when the Estes Kefauver's traveling organized crime hearings came to town and were followed by the sensational misconduct trials of several local officials. Although many of the worst offenders in government and the mob were not charged, the trials helped to end the sense of lawlessness which had prevailed in Tampa for decades. MacDill Air Force Base during World War II. In 1970, the Census Bureau reported city's population as 80.0% white and 19.7% black. Tampa is located on the West coast of Florida at 27°58′15″N 82°27′53″W﻿ / ﻿27.97083, -82.46472 (27.970898, −82.464640). According to the United States Census Bureau, the city has a total area of 170.6 square miles (442 km2) including 112.1 square miles (290 km2) of land and 58.5 square miles (151.5 km2) (34.31%) of water. The highest point in the city is only 48 feet (15 m). Tampa is bordered by two bodies of water, Old Tampa Bay and Hillsborough Bay, both of which flow together to form Tampa Bay, which in turn flows into the Gulf of Mexico. The Hillsborough River flows out into Hillsborough Bay, passing directly in front of Downtown Tampa and supplying Tampa's main source of fresh water. Palm River is a smaller river flowing from just east of the city into McKay Bay, which is a smaller inlet, sited at the northeast end of Hillsborough Bay Tampa's geography is marked by the Interbay Peninsula which divides Hillsborough Bay (the eastern) from Old Tampa Bay (the western). Tampa's climate shows characteristics of a tropical climate, but is situated on the southern fringe of the humid subtropical climate (Köppen Cfa) zone. Tampa's climate generally features hot summer days with frequent thunderstorms in the summer (rain is less frequent in the fall and winter), and a threat of a light winter freeze from November 15 through March 5 caused by occasional cold fronts from the north. Freezes do not happen every year though, especially towards South Tampa and areas near the bay. Light freezes every year are more likely in northern Tampa and areas away from the water. Since Tampa has some characteristics of a tropical climate, hard freezes (defined by the National Weather Service as below 28 °F (−2.2 °C)) happen rarely (every 5 to 20 years depending on location). Because of Tampa Bay, Tampa is split between two USDA climate zones. According to the 2012 USDA Plant Hardiness Zone Map, Tampa is listed as USDA zone 9b north of Kennedy Boulevard away from the bay and 10a south of Kennedy Boulevard and along the bay, Zone 10a is about the northern limit of where coconut palms and royal palms can be grown, although some specimens do grow in northern Tampa. Southern Tampa has much more tropical foliage than the northern parts of the city. Average highs range from 70 to 90 °F (21 to 32 °C) year round, and lows 52 to 76 °F (11 to 24 °C). Tampa's official recorded high has never hit 100 °F (37.8 °C) – the all-time record high temperature is 99 °F (37 °C), recorded on June 5, 1985. Temperatures are warm to hot from around mid-May through mid-October, which roughly coincides with the rainy season. Summertime weather is very consistent from June through September, with daytime highs near 90 °F (32 °C), lows in the mid-70s °F (23–24 °C), and high humidity. Afternoon thunderstorms, usually generated by the interaction of the Gulf and Atlantic sea breezes, are such a regular occurrence during the summer that the Tampa Bay area is recognized as the "Lightning Capital of North America". Every year, Florida averages 10 deaths and 30 injuries from lightning strikes, with several of these usually occurring in or around Tampa. Though it is affected by tropical storms every few years and threatened by tropical systems almost annually, Tampa has not taken a direct hit from a hurricane since 1921. That seemed about to change in 2004, when Hurricane Charley was forecast to enter the mouth of Tampa Bay and make landfall near downtown Tampa, with potentially devastating effects for the entire region. The danger prompted one of the largest evacuations in state history, with many residents taking refuge in the Orlando area. But Charley never reached Tampa Bay. After paralleling Florida's southwest coastline, the storm suddenly and unexpectedly swerved to the east and slammed into Punta Gorda instead. Charley then traveled northeast across the state and hit Orlando, where many Tampa residents had taken refuge, as a category 2 storm. The regular summertime afternoon thundershowers occasionally intensify into a severe thunderstorm, bringing heavy downpours, frequent lightning, strong straight-line winds, and sometimes hail. Tornadoes and waterspouts are less common, and they tend to be weaker and shorter-lived (typically EF0 on the Enhanced Fujita Scale) than those in tornado alley. The arrival of spring cold fronts sometimes bring stronger tornadoes to west central Florida. An F4 (Old Fujita scale) struck northern Tampa and the University of South Florida on April 4, 1966 causing severe damage and killing 3 people in north Tampa. However, this was an unusual event. Tampa skyline panorama facing north. Tampa skyline panorama facing east. The Ybor City District is home to several buildings on the National Register of Historic Places and has been declared a National Historic Landmark. Notable structures include El Centro Español de Tampa, El Centro Asturiano and other social clubs built in the early 1900s. The City of Tampa is served by Tampa Fire Rescue. With 22 fire stations the department provides fire and medical protection for Tampa and New Tampa. Station 1, located on 808 East Zack Street in Downtown, serves as headquarters and houses Engine 1, Truck 1, Rescue Car 1, Heavy Rescue 1, and Vent Truck 1. The busiest firehouse in the city is Station 13, housing Engine 13, Rescue Car 13. After three years of service in the department, members must become Florida State Certified Paramedics. Marshall Student Center at the University of South Florida. Downtown Tampa as seen from above. Service, retail, finance, insurance, shipping by air and sea, national defense, professional sports, tourism, and real estate all play a vital role in the area's economy. Hillsborough County alone has an estimated 740,000 employees, a figure which is projected to increase to 922,000 by 2015. Many corporations, such as large banks and telecommunications companies, maintain regional offices in Tampa. MacDill Air Force Base also remains a major employer as the parent installation for over 15,000 active uniformed military, Department of Defense (DoD) civil service and DoD contractor personnel in the Tampa Bay area. A significant majority of the civil service and contractor personnel are, in fact, themselves retired career military personnel. In addition to the 6th Air Mobility Wing, which is "host wing" for the base, MacDill is also home to Headquarters, United States Central Command (USCENTCOM), Headquarters, United States Special Operations Command (USSOCOM), the 927th Air Refueling Wing, Headquarters, United States Marine Forces Central Command (USMARCENT), Headquarters, United States Special Operations Command Central (USSOCCENT), and numerous other military activities of the active and reserve components of the armed forces. Tampa and its surrounding suburbs are host to over 20 hospitals and four trauma centers. Three of the area's hospitals were ranked among "America's best hospitals" by US News and World Report. It is also home to many health research institutions. The major hospitals in Tampa include Tampa General Hospital, St. Joseph's Children's & Women's Hospital, James A. Haley Veterans Hospital, H. Lee Moffitt Cancer Center & Research Institute and The Pepin Heart Institute. Shriners Hospitals for Children is based in Tampa. Advocated for World Health is a Tampa based non-profit that reuses medical waste and donates it to hospitals in need around the globe. USF's Byrd Alzheimer's Institute is both a prominent research facility and Alzheimer's patient care center in Tampa. Along with human health care, there are hundreds of animal medical centers including a Humane Society of America. Major daily newspapers serving the city are The Tampa Tribune and The Tampa Bay Times. 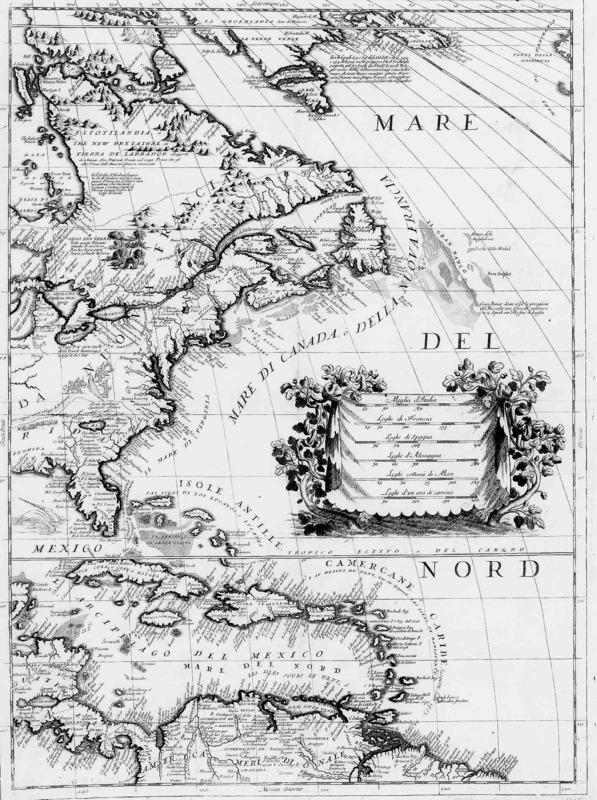 La Gaceta is the nation's only trilingual newspaper, written in English, Spanish, and Italian. There is also a wide variety of smaller regional newspapers, alternative weeklies, and magazines, including the Florida Sentinel Bulletin, Creative Loafing, Reax Music Magazine, The Oracle, Tampa Bay Business Journal, and MacDill Thunderbolt. Major television affiliates include WFTS 28 (ABC), WTSP 10 (CBS), WFLA 8 (NBC), WTVT 13 (Fox), WTOG 44 (The CW), WTTA 38 (MyNetworkTV), and WVEA 62 (Univision). TECO's coal-fired Big Bend Power Station supplies most of the city's energy. The Lee Roy Selmon Crosstown Expressway features an elevated double-decker highway. Three motor vehicle bridges cross Tampa Bay to Pinellas County from Tampa city limits: the Howard Frankland Bridge (I-275), the Courtney Campbell Causeway (SR 60), and the Gandy Bridge (U.S. 92). The old Gandy Bridge was completely replaced by new spans during the 1990s, but a span of the old bridge was saved and converted into a pedestrian and biking bridge renamed The Friendship Trail. It is the longest overwater recreation trail in the world. However, the bridge was closed in 2008 due to structural problems. Eastern terminus of the Howard Frankland Bridge. There are two major expressways (toll) bringing traffic in and out of Tampa. The Lee Roy Selmon Expressway (SR 618) (formerly known as the Crosstown Expressway), runs from suburban Brandon at its eastern terminus, through Downtown Tampa, to the neighborhoods in South Tampa (near MacDill Air Force Base) at its western terminus. The Veterans Expressway (SR 589), meanwhile connects Tampa International Airport and the bay bridges to the northwestern suburbs of Carrollwood, Northdale, Westchase, Citrus Park, Cheval, and Lutz, before continuing north as the Suncoast Parkway into Pasco and Hernando counties. Along with highways, major surface roads serve as main arteries of the city. These roads are Hillsborough Avenue (U.S. 92 and U.S. 41), Dale Mabry Highway (U.S. 92), Nebraska Avenue (U.S. 41/SR 45), Florida Avenue (U.S. 41 Business), Bruce B. Downs Boulevard, Fowler Avenue, Busch Boulevard, Kennedy Boulevard, Adamo Drive, and Dr. Martin Luther King Jr. Boulevard. Carnival Inspiration at port in Tampa. In 1899 however, the U.S. Congress authorized the dredging of a 27' deep channel to Port Tampa, Henry Plant's rail-to-ship facility just west of Tampa. In 1917 another channel was dredged out to the Port of Tampa proper, instantly making Tampa an important shipping location. Tugboat pushes a barge at the Port of Tampa. The bay bottom is very sandy, and the ship channels need constant dredging to keep them navigable to the largest modern cargo ships. Every year, the U.S. Army Corps of Engineers dredge up enough sediment from the bay to fill Raymond James Stadium ten times. Weekly containerized cargo service is available in the Port of Tampa. Ports America operates two container berths, three gantry cranes, a 100 ton Mobile Harbor Crane and a container terminal. Zim American Integrated Shipping Company has been providing global connections to the Port of Tampa for the past ten years. MSC has recently partnered with Zim on a joint service connecting the Port of Tampa to an additional global network. The port's longest running container carrier Tropical Shipping recently ceased operations in the Port of Tampa. Horizon Lines also made a short lived attempt to provide service to the port but quickly pulled the plug. Currently 3,000 to 4,250 TEU containerships regularly call the Port of Tampa. Public mass transit within Tampa is operated by the Hillsborough Area Regional Transit Authority (HART), and includes public bus and paratransit service, as well as a streetcar line. The HART bus system's main hub is the Marion Transit Center in Downtown Tampa, serving nearly 30 local and express routes. HART has a signed transit deal with the University of South Florida, allowing students to ride for free on most bus routes, while students from other schools may receive discounted fares. HART is also currently making a bus rapid transit system called MetroRapid that will run between Downtown and the University of South Florida. A HARTLine bus picking up passengers at the Marion Transit Center. In October, 2002, the TECO Line Streetcar System brought electric streetcar service back to Tampa for the first time in over half a century. The line currently operates from eleven stations along a 2.7-mile (4.35-km) route, connecting Ybor City, the Channel District, the Tampa Convention Center, and downtown Tampa. The TECO Line fleet features varnished wood interiors and other appointments reminiscent of the streetcars that traversed Tampa between the late 19th and mid-20th centuries. The nostalgic design is incorporated with modern functionality, as the cars are both wheelchair accessible and air conditioned. Limited transportation by privately operated "Neighborhood Electric Vehicles" (NEV) is available, primarily in Downtown Tampa and Ybor City. Water taxis are available on a charter basis for tours along the downtown waterfront and the Hillsborough River. Regular water taxi service may be possible in the future as docks and facilities are developed in conjunction with the Tampa Riverwalk. A KC-135R stationed at MacDill flying over Tampa Bay. The MacDill AFB flight line was temporarily closed and the 56th Fighter Wing transferred to Luke AFB, Arizona following the 1991 round of base closings under the Base Realignment and Closure Commission (BRAC) discussions; at the time, the base was used for F-16 fighter training and operations and increasing level of civilian air traffic in the Tampa Bay area was considered detrimental to training. The noise produced by the fighter aircraft was also considered inappropriate in a densely populated area. However, despite committee recommendations, the base remained open to house and support CENTCOM and SOCOM under the cognizance of the newly activated 6th Air Base Wing. With the disestablishment of Tactical Air Command a few months later, claimancy for MacDill passed to the newly created Air Combat Command. The MacDill flight line was initially reopened in 1992 to temporarily support F-16 aircraft from the 31st Fighter Wing and the Air Force Reserve's 482d Fighter Wing, following the destruction of their home station, Homestead AFB, Florida, in the wake of Hurricane Andrew. In 1993 the MacDill flightline was permanently reopened for NOAA WP-3D "hurricane hunter" operations, which had relocated from Miami International Airport. In 1996, the 91st Air Refueling Squadron moved to MacDill from Malmstrom Air Force Base, Montana, the 6th Air Base Wing was renamed the 6th Air Refueling Wing. It was renamed the 6th Air Mobility Wing after the 310th Airlift Squadron was activated on the base and the installation officially came under the Air Mobility Command. The Channelside Entertainment Complex in Tampa's Channel District. Tampa is home to several death metal bands, an extreme form of heavy metal music that evolved from thrash metal. Many of the genre's pioneers and foremost figures are based in and around the city. Chief among these are Deicide, Six Feet Under, Obituary, Cannibal Corpse, and Morbid Angel. The Tampa scene grew with the birth of Morrisound Recording, which established itself as an international recording destination for metal bands. The underground rock band, the Baskervils, got their start in Tampa. They played the Tampa Bay area between 1994 and 1997 and then moved to New York City. Underground hip-hop group Equilibrium is based out of Tampa, as well as the Christian metalcore band, Underoath. The city of Tampa operates over 165 parks and beaches covering 2,286 acres (9.251 km2) within city limits; 42 more in surrounding suburbs covering 70,000 acres (280 km2), are maintained by Hillsborough County. These areas include the Hillsborough River State Park, just northeast of the city. Tampa is also home to a number of attractions and theme parks, including Busch Gardens Tampa Bay, Adventure Island, Lowry Park Zoo, and Florida Aquarium. Busch Gardens Tampa Bay is a 335-acre (1.356 km2) Africa-themed park located near the University of South Florida. It features many thrilling roller coasters, for which it is known, including Sheikra, Montu, Gwazi and Kumba. Visitors can also view and interact with a number of African wildlife. Other notable events include the Outback Bowl, which is held New Year's Day at Raymond James Stadium. Each February, The Florida State Fair brings crowds from across the state, while "Fiesta Day" celebrates Tampa's Cuban, German, Italian, African-Cuban, Jewish and Spanish immigrant heritage. The India International Film Festival (IIFF) of Tampa Bay also takes place in February. In April the MacDill Air Fest entertains as one of the largest military air shows in the U.S. Guavaween, a nighttime street celebration infuses Halloween with the Latin flavor of Ybor City. Downtown Tampa hosts the largest anime convention in Florida, Metrocon, a three-day event held in either June or July at the Tampa Convention Center. Ybor also hosts "GaYbor Days", an annual street party in the GLBT-friendly GaYbor district. The Tampa International Gay and Lesbian Film Festival, held annually since 1989, is the city's largest film festival event, and one of the largest independent gay film festivals in the country. Communities of faith have organized in Tampa from 1846, when a Methodist congregation established the city's first church, to 1939, when a 21-year-old Billy Graham began his career as a spiritual evangelist and preacher on downtown's Franklin Street, and through to today. Among Tampa's noteworthy religious structures are Sacred Heart Catholic Church, a 1905 downtown landmark noted for its soaring, Romanesque revival construction in granite and marble with German-crafted stained glass windows, the distinctive rock and mortar St. James Episcopal House of Prayer, listed with the U.S. historic registry, and the St. Paul A.M.E. church, which has seen the likes of Dr. Martin Luther King, Jr., and President Bill Clinton speak from its pulpit. The later two have been designated by the city government as Local Landmark Structures. Around the city are located a handful of mosques for followers of Islam, as well as a Tibetan-style Buddhist temple, a Thai Buddhist Wat, and local worship centers for the Sikh, Hindu and Bahá'í faiths. The Church of Scientology, based in nearby Clearwater, maintains a location for its cult in Tampa. The Tampa Bay Buccaneers began in 1976 as an expansion team of the NFL. They struggled mightily at first, losing their first 26 games in a row to set a league record for futility. After a brief taste of success in the late 1970s, the Bucs again returned to their losing ways, and at one point lost 10+ games for 12 seasons in a row. The hiring of Tony Dungy in 1996 started an improving trend that eventually led to the team's first Super Bowl title in 2002 under coach Jon Gruden. 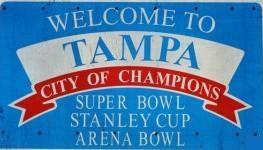 The Tampa Bay Storm moved to the area from Pittsburgh in 1991 and promptly won their first Arena Bowl championship. They have won four subsequent championships (1993, 1995, 1996, and 2003), more than any other Arena Football League team. The Storm played in Tropicana Field until 1997, when they moved to the Tampa Bay Times Forum. The NHL's Tampa Bay Lightning was established in 1992, and currently play their home games in the Tampa Bay Times Forum, located in the Channelside district of downtown Tampa. In 2004, the team won their first Stanley Cup championship against the Calgary Flames. The Tampa Bay area has long been home to spring training, minor league, and excellent amateur baseball. Accordingly, there was some cross-bay competition for a Major League Baseball franchise throughout the 1980s and 1990s until the Tampa Bay Rays (originally "Devil Rays") began playing in 1998 at Tropicana Field in St. Petersburg. After a decade of futility, the Rays made it to the 2008 World Series and won the American League East in 2008 and 2010, and the American League Wild Card in 2011. The Tampa Bay Rowdies of the original North American Soccer League was the area's first major sports franchise, beginning play in Tampa Stadium in 1975. The Rowdies were an immediate success, drawing good crowds and winning the inaugural Soccer Bowl in their first season to bring Tampa its first professional sports championship. Though the NASL ceased operations in 1984, the Rowdies continued to compete in various indoor and outdoor soccer leagues until finally folding in 1993. A new incarnation of the Tampa Bay Rowdies compete in a new incarnation of the North American Soccer League (2nd Division in the U.S. & Canada). The team took the pitch as FC Tampa Bay in 2010 because of a licensing dispute over the "Rowdies" moniker and finally gained control of the old name and logos before the 2012 season. They played in George M. Steinbrenner field in Tampa during their first campaign and moved to Al Lang Field in St. Pete in 2011. In 2012, the Rowdies were crowned champions of the NASL. The city was also home to USL Pro (3rd Division) club VSI Tampa Bay which ceased operations after the 2013 season. The city was home to the Major League Soccer team Tampa Bay Mutiny. The Mutiny were the first MLS club to win the Supporters' Shield in the league's history. The club, which was run by the league, operated from 1996 until 2001 when local ownership could not be secured. The city has no current representation in MLS. Hillsborough Community College participates in Division I of the NJCAA. Sports include men's baseball and basketball, and women's basketball, softball, tennis and volleyball. The University of South Florida began playing intercollegiate sports in 1965. The South Florida Bulls established a basketball team in 1971 and a football team in 1997. The football Bulls joined the Big East in 2005, and under former head coach Jim Leavitt, rose to as high as #2 in the BCS rankings in 2007. ^ "Ybor City: Cigar Capital of the World". Nps.gov. June 28, 1999. http://www.nps.gov/nr/twhp/wwwlps/lessons/51ybor/51ybor.htm. Retrieved July 5, 2013. ^ "Alive: Ybor stumbled upon Guavaween". Sptimes.com. October 29, 1999. http://www.sptimes.com/News/102999/Alive/Ybor_stumbled_upon_Gu.shtml. Retrieved July 5, 2013. ^ "Buckhorn picks city attorney". St. Petersburg Times — www.tampabay.com. http://www.tampabay.com/news/localgovernment/buckhorn-picks-city-attorney/1163213. Retrieved 2011-04-23. ^ "Table 3. Annual Estimates of the Resident Population for Incorporated Places in Florida: April 1, 2010 to July 1, 2011" (CSV). U.S. Census Bureau. http://www.census.gov/popest/data/cities/totals/2011/tables/SUB-EST2011-03-12.csv. Retrieved March 13, 2013. ^ "Tampa, Florida (FL) Zip Code Map – Locations, Demographics – list of zip codes". City-data.com. http://www.city-data.com/zipmaps/Tampa-Florida.html. Retrieved 2010-02-23. ^ "Tampa". The American Heritage Dictionary of the English Language. Houghton Mifflin Harcourt. http://ahdictionary.com/word/search.html?q=Tampa. Retrieved December 4, 2011. ^ a b "Tampa, Florida: Census". Quickfacts.census.gov. http://quickfacts.census.gov/qfd/states/12/1271000.html. Retrieved 2011-04-17. ^ "Table 1. The 15 Fastest-Growing Large Cities from April 1, 2010, to July 1, 2011".United States Census Bureau. Retrieved 2011-03-18. ^ "Tampa Bay, Florida Demographics". tampabay.us. http://www.tampabay.us/demographics.aspx. Retrieved 2013-01-01. ^ Reports (2009-01-29). "For Nearly Half of America, Grass Is Greener Somewhere Else; Denver Tops List of Favorite Cities | Pew Social & Demographic Trends". Pewsocialtrends.org. http://www.pewsocialtrends.org/2009/01/29/for-nearly-half-of-america-grass-is-greener-somewhere-else-denver-tops-list-of-favorite-cities/. Retrieved 2013-12-09. ^ "GaWC - The World According to GaWC 2012". Lboro.ac.uk. 2014-01-13. http://www.lboro.ac.uk/gawc/world2012t.html. Retrieved 2014-01-25. ^ "GaWC – The World According to GaWC 2010". Lboro.ac.uk. 2011-09-14. http://www.lboro.ac.uk/gawc/world2010t.html. Retrieved 2011-09-28. ^ a b "ABOUT TAMPA BAY – PINELLAS COUNTY HISTORY – WEBCOAST PAGE TAMPA BAY TAMPA FLORIDA". www.webcoast.com. http://www.webcoast.com/pinellas.htm. Retrieved 2008-02-24. ^ "Hull of Civil War sloop likely found in Tampa river – St. Petersburg Times". Tampabay.com. http://www.tampabay.com/news/article516881.ece. Retrieved 2010-02-23. ^ "Gasparilla Pirate Festival – Tampa, Florida". Gasparillapiratefest.com. http://www.gasparillapiratefest.com. Retrieved 2010-02-23. ^ "CENSUS OF POPULATION AND HOUSING (1790–2000)". U.S. Census Bureau. http://www.census.gov/prod/www/abs/decennial/index.html. Retrieved 2011-04-11. ^ "Tampa (city) QuickFacts from the US Census Bureau". Quickfacts.census.gov. http://quickfacts.census.gov/qfd/states/12/1271000.html. Retrieved July 5, 2013. ^ a b c d "Average Weather for Tampa, FL – Temperature and Precipitation". www.weather.com. http://www.weather.com/outlook/recreation/outdoors/wxclimatology/monthly/graph/USFL0481?from=search. Retrieved 2008-02-23. ^ "Mean Number of Days With Minimum Temperature 32 °F or Less". National Climatic Data Center. 2004-06-23. http://lwf.ncdc.noaa.gov/oa/climate/online/ccd/min32temp.html. Retrieved 2007-03-06. ^ Citrus farmers reeling from cold St. Petersburg Times, December 27, 1989. ^ Anderson, Anne W. (2009). Insiders' Guide to the Greater Tampa Bay Area. Globe Pequot. pp. 264–265. ISBN 0-7627-5347-1. http://books.google.com/?id=f4LDwCA8B3EC&printsec=frontcover#v=onepage&q&f=false. Retrieved May 12, 20f11. ^ Anderson, Anne W. (2009). Insiders' Guide to the Greater Tampa Bay Area. Globe Pequot. p. 265. ISBN 0-7627-5347-1. http://books.google.com/?id=f4LDwCA8B3EC&printsec=frontcover#v=onepage&q&f=false. Retrieved May 12, 2011. ^ Anderson, Anne W. (2009). Insiders' Guide to the Greater Tampa Bay Area. Globe Pequot. p. 263. ISBN 0-7627-5347-1. http://books.google.com/?id=f4LDwCA8B3EC&printsec=frontcover#v=onepage&q&f=false. Retrieved May 12, 2011. ^ Anderson, Anne W. (2009). Insiders' Guide to the Greater Tampa Bay Area. Globe Pequot. pp. 263–264. ISBN 0-7627-5347-1. http://books.google.com/?id=f4LDwCA8B3EC&printsec=frontcover#v=onepage&q&f=false. Retrieved May 12, 2011. ^ "Tampa Downtown Partnership – Elevating The Potential". Tampasdowntown.com. http://tampasdowntown.com/default.aspx. Retrieved 2011-04-17. ^ "Tony Jannus, An Enduring Legacy of Aviation". The Tony Jannus Distinguished Aviation Society.. Retrieved February 23, 2010. ^ "Take Flight", December 2009. The Tony Jannus Distinguished Aviation Society. Retrieved February 23, 2010. ^ "Tampa Port Authority". Flaports.org. http://www.flaports.org/Sub_Content3.aspx?id=26&pid=3. Retrieved 2013-12-09. ^ "Cruise Sailing Schedule 2009/2010". Tampa Port Authority. Retrieved January 28, 2010. ^ "Adult Student Fare." Hillsborough Area Regional Transit. Retrieved on December 17, 2006. ^ "Water taxis in downtown Tampa gain interest – St. Petersburg Times". Tampabay.com. http://www.tampabay.com/news/business/economicdevelopment/article976626.ece. Retrieved 2010-02-23. ^ "Famed Tampa wrestler Jack Brisco dies at 68 – St. Petersburg Times". Tampabay.com. http://www.tampabay.com/news/obituaries/famed-tampa-wrestler-jack-brisco-dies-at-68/1069959. Retrieved 2011-04-17. ^ "Neighborhood notes: Group helps promote Palma Ceia merchants – St. Petersburg Times". Tampabay.com. http://www.tampabay.com/news/humaninterest/article925102.ece. Retrieved 2010-02-23. ^ "Metrocon About Metrocon". Retrieved August 13, 2012. ^ "GaYbor Days will make your Fourth fabulous – St. Petersburg Times". Tampabay.com. http://www.tampabay.com/features/events/article657346.ece?comments=legacy. Retrieved 2010-02-23. ^ “Tampa – Florida’s Industrial Port City”. Florida History Internet Center. Retrieved February 27, 2010. ^ “Our History”. St. James House of Prayer. Retrieved February 27, 2010. ^ Pichaya Fitts (April 14, 2003). "'A little piece of Thailand'". Tampa Bay Times. http://www.sptimes.com/2003/04/14/TampaBay/_A_little_piece_of_Th.shtml. Retrieved 2012-01-01. ^ "Hillsborough Community College". NJCAA. http://www.njcaa.org/colleges_college_home.cfm?collegeId=1360. Retrieved 2013-12-09. ^ Florence, Jeanne. "Le Havre - Les villes jumelées [Le Havre - Twin towns]" (in French). Archived on 2009-09-03. Error: If you specify |archivedate=, you must also specify |archiveurl=. http://archives.lehavre.fr/delia-CMS/guichet_virtuel/rubrique/article_id-1626/topic_id-707/les-villes-jumelees.html. Retrieved 2013-08-07. ^ "Le Havre - Les villes jumelées [Le Havre - Twin towns]" (in French). City of Le Havre. Archived from the original on 2013-07-24. http://web.archive.org/web/20130729215238/http://lehavre.fr/dossier/le-havre-ville-partenaire. Retrieved 2013-08-07. ^ "Sister cities of İzmir". Izmir Metropolitan Municipality. http://www.izmir.bel.tr/en/kardeskentler.asp. Retrieved 2012-10-22. Kerstein, Robert (2001). Politics and Growth in Twentieth-Century Tampa. Gainesville, FL: University Press of Florida. ISBN 0-8130-2083-2. Milanich, Jerald (1995). Florida Indians and the Invasion from Europe. Gainesville, FL: University Press of Florida. ISBN 0-8130-1360-7. This page uses content from the English language Wikipedia. The original content was at Tampa, Florida. The list of authors can be seen in the page history. As with this Familypedia wiki, the content of Wikipedia is available under the Creative Commons License.